I received products from Think Jam to help in making blankets. The opinions within this post are of my own and I was not influenced in any way. Please do your own research before purchasing products or using services. Your opinions and results may differ. 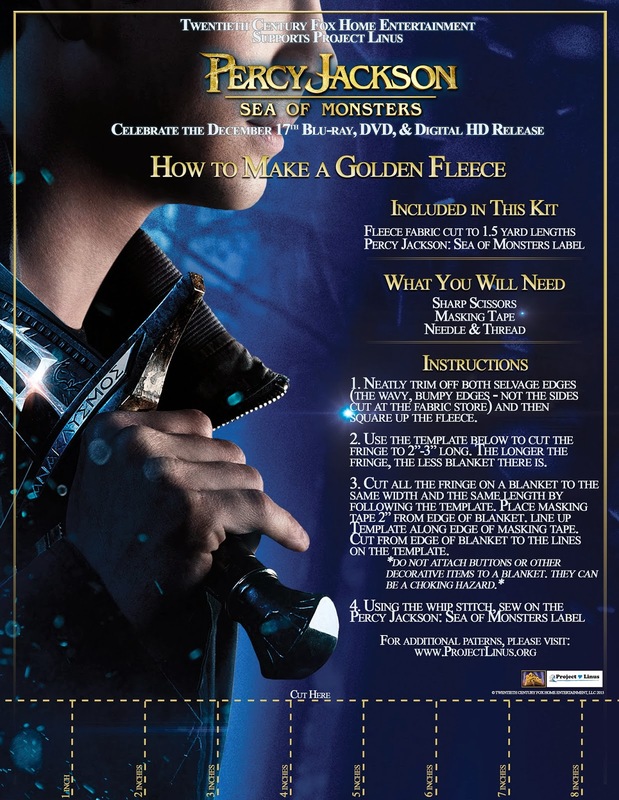 Percy Jackson: Sea of Monsters is now available on DVD and Blu-ray. It's an entertaining action-packed movie that's worth watching. Right before the holidays I gathered with a few gals to create blankets for Project Linus, in cooperation with Percy Jackson. For those not in the know (like myself until recently), Project Linus is an organization that helps distribute homemade blankets to children in shelters and hospitals. Volunteers, also known as "blanketeers", make the blankets and mail or take them to the nearest Project Linus drop-off location. For the Percy Jackson/Project Linus Blanket Making Party, I had a few close friends over at my home and even got a couple of my teen kids involved. We dedicated several hours to cutting, looping, and sewing. It was a large task to undergo considering we had fifteen blankets to create, but the atmosphere was fun and we were excited to be a part of something big. Some of the blankets we created were done so with a guideline sheet we received. A big shout-out goes to my friend, Terri, who is knowledgable in crafts and helped us along the way. Making the blankets involved cutting strips of fringe the same length and width apart. Although the blankets were perfectly fine that way, a friend also suggested a different manner for some of the blankets. It involved doing the same thing as the guideline instructed but also poking holes in the top of the fringe and looping them through to create a more polished look. After each blanket was finished, a Percy Jackson tag was sewn on. The blankets were then boxed up and shipped out to a drop-off location. I was very appreciative of the help of my friends in completing this project. All hands were on deck and we worked diligently. It made us feel good to know we were doing a small part in helping a worthwhile cause. I'm also appreciative that the PR agency gave me the opportunity to help touch lives. We saw that movie at the drive in and loved it. Those blankets are awesome btw! This is the first I have heard of the Project Linus Blanket, how wonderful! Now that I know about it, I am definitely going to participate next year. However, I am not very talented in the sewing department, so I will most likely buy one! That's so great that the movie studio is partnering to give back to the community. I think you and your friends are amazing teaming up like that. I'm amazed that I've not heard anything about this in the media. Doing good for the community warrants some type of shout out !! That is a fabulous way to give back! I love that the studio (and you!) donated time and materials to brightening the day of those in need!